Pain is an uncomfortable feeling and it’s a way for your body to tell you something may be wrong. It can be steady, throbbing, stabbing, aching, pinching, or described in many other ways. Sometimes, it’s just a nuisance, like a mild headache. Other times it can be debilitating. Nearly 100 million Americans experience chronic pain -more than those who have diabetes, heart disease and cancer combined. The two main categories of pain include acute and chronic pain, which can affect any part of your body. Some of the most common forms of pain are back and neck, joint, headaches, nerve damage, injury related, cancer pain, and pain-related conditions such as fibromyalgia (a disorder that causes widespread musculoskeletal pain). Acute pain usually follows a trauma, surgery or other condition. This type of pain typically lasts a short time and as the body heals, the discomfort decreases. Its purpose is to alert you to injury and protect you from further harm. However, this may not always be the case. When pain lasts beyond the expected time for healing following a trauma, surgery or other condition, this is known as chronic pain. Chronic pain can also exist for no clear reason at all. It can be characterized by changes in the central nervous system or it can be a symptom of another disease process. Chronic pain can be a disease of its own and can be very debilitating. It can range from mild to severe pain but can be present for long periods of time. Examples of chronic pain may include phantom limb pain following an amputation, chronic back pain due to spinal stenosis, and cancer pain. Cancer pain can occur in the beginning stages, end stages, or throughout the course of the disease. In cancer survivors, it can be a severe and debilitating side-effect of treatment. Many individuals nowadays are interested in decreasing the use of prescription pain medications or combining conventional with nonconventional treatments. Using an integrative approach to treating pain includes therapies that are used in addition to those used in conventional medicine. An example would be practicing yoga or acupuncture in addition to taking a prescription analgesic. Researchers and health care professionals are finding that integrative medicine can provide positive outcomes for a broad range of pain causes. Combining conventional medicine and integrative approaches can help relieve pain and improve quality of life. Be sure to speak to your doctor about the best treatment approach for you. Physical Therapy will perform a thorough evaluation and assessment of your current signs, symptoms, limitations, and abilities. These findings will help determine a treatment program to increase your activity tolerance for functional activities of daily living, work activities, leisure skills, and recreation. Patients will also be educated in different movement and coping strategies to increase motion tolerance while learning to work through the pain. Physical therapy treatments and interventions will teach patients how to improve their flexibility, strength, and endurance through the use of exercises, stretching, positioning, postural awareness and movement strategies. Other approaches to care may include cardiovascular exercises, gait training, manual therapy, neuromuscular re-training, postural exercises, spinal stabilization/core stability training, and various modalities (ultrasound, deep tissue mobilization, moist heat). At the completion of the program the patient will be able to demonstrate better movement strategies, improved posture, identify movement combinations of pain flare-ups and strategies for relief, and exercise/stretching techniques. The patient will be provided with instructions to allow them to progress to an independent home program/gym facility participation for continued gains within pain maintenance/awareness. Occupational Therapy assesses which daily life activities someone with chronic pain may be having difficulty in or is not able to perform at all. The goal of occupational therapy is to help individuals return to activities that are important to them. The activities that occupational therapy may address could be those required for work, school, self-care, homemaking, church, community or sleep. Individual’s with chronic pain often experience decreased participation in physical activity, changes in posture, changes in movement patterns, fatigue, fear of movement, joint stiffness, and weakness. Occupational therapy can help clients learn how to carry out daily activities without making their pain worse. This allows our clients to return to the activities and roles that are important to them. It is not uncommon for those individuals with chronic pain to experience frequent loss of balance or falls. Fear of falling can often cause individuals to limit their physical activity to avoid the chance of falling. Occupational therapy works to identify areas that could be putting an individual at risk for falls and how they can prevent them in the future. It is also important to consider how chronic pain affects emotional health, relationships, and motivation. Occupational therapy can help individuals identify how these changes could be affecting their overall function. Occupational Therapy can teach individuals coping strategies that will allow them to better manage their pain and resulting stress such as relaxation and visualization techniques. Aquatic Therapy is an evidence-based treatment designed to improve or sustain gait, muscle strength and endurance, balance, agility, function, coordination, flexibility, function, body mechanics and posture. It is a common treatment for people of all ages, fitness levels, and injuries. Exercising has been proven to release endorphins to the brain while reducing pain and helping to heal the body. However, it’s hard to exercise if you’re in a constant state of discomfort. When standing chest deep in water, the body is 80% weightless, bearing only 20% of its weight. This weightlessness helps with aquatic therapy exercises and movements that could otherwise be too difficult on land. With gravity relief, movement in the water doesn’t have the stresses on the body as it would on land, which in essence makes movements feel cushioned, safe and secure. Aquatic therapy can allow you to be more active while also feeling safer. This, in turn, can help to increase endurance, cardiovascular fitness, flexibility, and strength. Orthotics are specialized devices such as shoe inserts, knee braces, ankle braces, or back braces that are designed to support your bone and muscle health. Bracing can also limit, or block, certain motions that are undesirable. Foot, ankle, knee and hip biomechanics are extremely complex. Most stores you visit may have fancy displays and technology that to “assess” or “scan” your feet with lasers or infravision. But, a machine does not have the same skill set and real knowledge that an orthotist can offer you through dynamic assessment. Orthotists have the best chance of providing a useful orthosis from your doctors prescription. Orthotists are trained in both gait analysis, lower body anatomy and biomechanics and the actual fabrication of custom foot orthoses. Other professionals order orthotics from an external supplier. Unfortunately, most consumers have never heard of orthotists and don’t know why they are the best choices, or where to find them. Look no more, Rehability has a certified orthotist on staff that can meet your needs. Pain impacts all aspects of a person’s life. At Rehability, we work as a team; however, you are the most important member of the team. Our emphasis is on self-management by helping you learn strategies to better manage pain and return to the activities that are truly important to you. 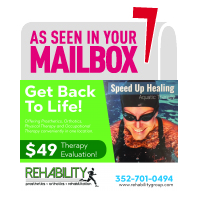 Rehability provides physical therapy, occupational therapy, and aquatic therapy services that assist our patients in returning to normal daily activities and routines. In addition, we also have a licensed orthotist on staff should bracing be prescribed by your physician. We are easily able to work together by being located in one clinic to offer you a truly multi-disciplined approach. If you are in pain, let us join your team to help you. We can be reached at (352) 701-0494.